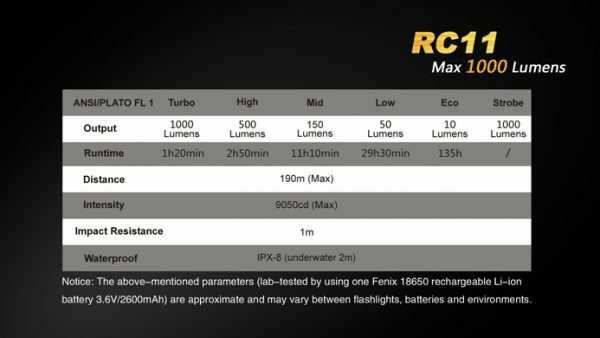 Fenix RC11 Flashlight, Lanyard, Spare O-ring,Holster, Two-position body clip, charging cable, 700mAh 16341 rechargeable Li-ion battery. When the light is off and unlocked, press and hold the side switch for 0.5 seconds to turn it on. When the light is on, press and hold the side switch for 0.5 seconds to turn it off. With the light on, single-click the side switch to cycle through Eco→Low→Mid→High→Turbo. Under unlocked state, press and hold the side switch for 1.2 seconds to enter into Strobe, click again to turn back to previously used General brightness level. Lock: When the light is off and unlocked, double-click the side switch in 0.5 seconds, the light will blink twice at Mid and then go out, indicating the light is locked. Unlock: When the light is off and locked, double-click the side switch in 0.5 seconds, the light will be unlocked and power on the last-used output level. Note: In locked state, the light only responds unlocking operation, press the side switch, the light will blink twice to remind the light is under locked state. The flashlight memorizes the last brightness level used in the General mode, the next time it is turned on, it will recall that previously used General brightness level. 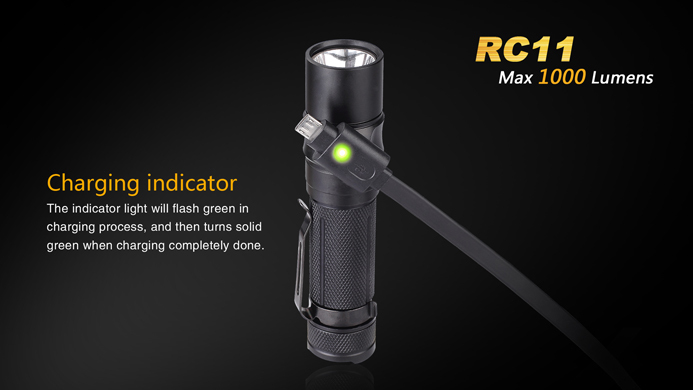 The flashlight will accumulate a lot of heat when it is working at Turbo brightness level. When it works at Turbo for 5 minutes, the flashlight will automatically downshift to High output to prevent the light from overheating. If the Turbo output is needed, please reset it again. 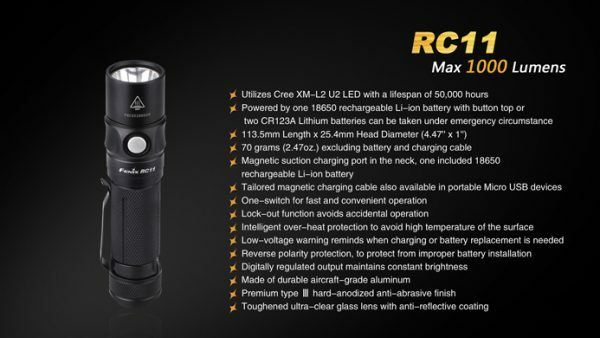 But the flashlight could be damaged or the normal service life could be shortened because of continuous use like this. 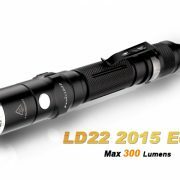 When the voltage level drops below the preset level, the flashlight is programmed to downshift to a lower brightness level. When this happens in Low output mode, the flashlight blinks three times every five minutes to remind you to charge the light or replace the battery. 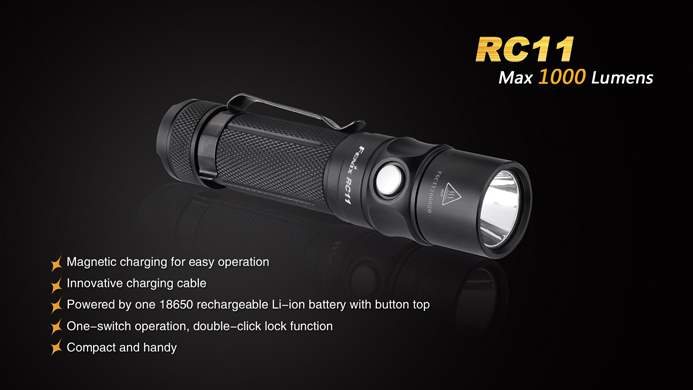 To ensure normal use, the flashlight will not turn off automatically and will work until the over-discharge function stops the battery from working. 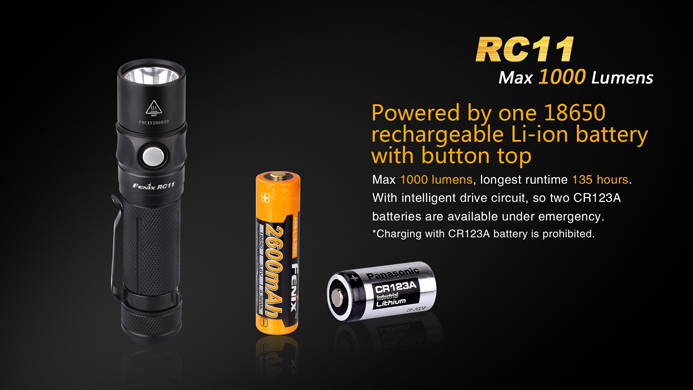 Note: This only works on 18650 rechargeable Li-ion battery. 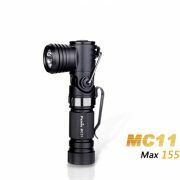 When the voltage of 18650 battery is detected lower than 3V, low-voltage warning function will fail if the flashlight is turned on again. 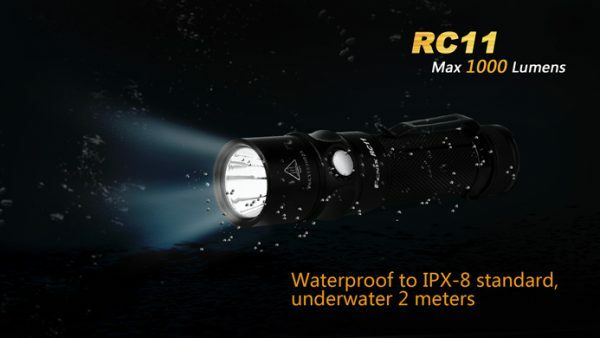 UC52 is a Micro USB rechargeable flashlight with super high performance. It is fitted with Cree XHP70 LED, which delivers a max output of 3100 lumens and a max distance of 253 meters. OLED screen digitally displays current output level, battery status and remaining runtime, which allows the users be prepared for their preparative plans. Built-in 7.2V/3500mAh Li-ion battery pack, dual side switches separately controls five output levels and Flash mode, integrated die casting for excellent heat dissipation, IP68 rated protection, UC52 is your reliable helper in climbing, hiking, camping and more. 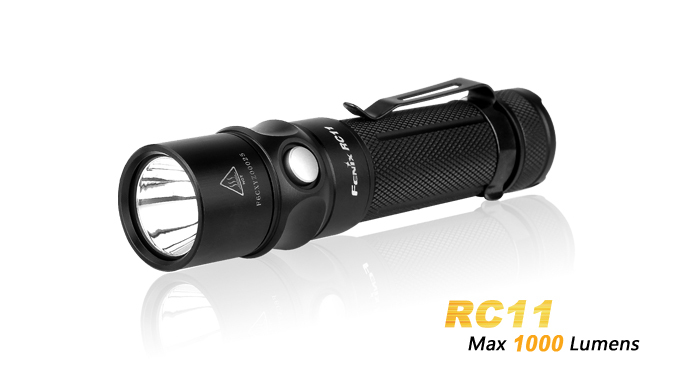 The category-defying MC11 angle light is a favorite among trade professionals and recreational users. 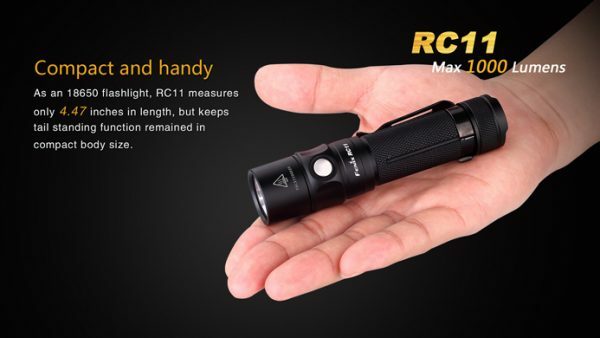 You can clip it to most anything, hung it via a lanyard or the built-in D-ring, tail stand it and adjust the head to put the light where you need it. Powered by one AA battery, the light produces a 155-lumen burst mode and 90 hours runtime on low mode.